You guys gonna Nerf this? Edited by Gabacho, 14 April 2017 - 03:00 AM. I dont think so, when it was first released along the infamous update, it raised quite a controversy because of some really op crafts, then it was changed so it could be used only with lmgs and ars. After a while, the island was introduced and with it, came the long range machine guns which could potentially hit the 40+ range marker. Well, i really dont think cons gonna look into that again, if so they would have already looked long long ago. EDIT: the "crafting festival" does not mean that players can get a 30% bonus, it only means that for a time the chances of getting a high bonus (up to 25%) will be higher. Right now, the 30% bonus bug is still active, but it will be capped again. Also, as far as I know, the crafting festival hasn't even started, since Con said there will be a proper announcment (please someone correct me if I'm wrong). Edited by Lana Woo, 14 April 2017 - 05:12 AM. Ok, thanks for the corrections, I was't online when this happened (though I sure wish I was). After all, the Vintages are still around. There was no crafting festival... there was a massive crafting glitch or bug that con did not fix fast enough. I will not Nerf any of your crafts, I am simply asking Con how they intend to fix this colossal error they made. At worst (if nothing is Nerfed) - They made ALL previous max crafts completely obsolete. Infamous or otherwise, what was a Max craft is not anymore. The grind for +25 was grueling. Last week the grind for +30 was... well not a grind at all. lana con say that those players who got 30% craft is luck on that time.and now the craft bonus reduce to 25% again which after this crafting will be 25%, before this those players who got 30% in craft festival will be vintage/discontinues or luck. respect those players who spend prems,fuels, component, books to craft those things. 2) the "respect those who spend lots of fuel, etc" also works in the other way: those who spent lots of fuel before this bug might be now pissed because of this, because they spent too many resources while playing as intended and now they are at a disadvantage. But if not, remember that you made a bet and sometimes those bets leave you on the losing side. Edited by Lana Woo, 14 April 2017 - 05:29 AM. I said exactly that: Con didn't say anything about the already crafted items. So that matter is still open: they might reverse, they might stay as they are, they might become vintage... only Con knows. Just as the "bet" I was talking before, I chose not to participate, and that was my bet: I did not get any 30% items, so if they stay is my loss, but if they are reversed then I saved my resources. I don't really have many prems and fuel to spend, so it was a good choice for me regardless. I played safe, so no reward for me. As for the unhappy players... I think that boat has sailed. There will be pissed off people regardless of the future of those items. Edited by Lana Woo, 14 April 2017 - 05:57 AM. I'm sure players who spent a fortune on buying and upgrading 107s are less than happy with current prices/value. The question becomes is it game-breaking? If the answer is "no" then they're here to stay. con didnt say that. con only remove the 30% bonus from craft not crafted item. Lana woo read full before comment here http://forum.conarti...en-crafted-fal/ If con remove those 30% crafted item many players will be unhappy included me, because already spend money, fuels, craft, book to craft those. besides that not only one inventory con need check, con need check all players inventory this will take time. again and again its not our fault, i will say its your fault because you didnt craft that time. Its all in the game. What exactly would you be unhappy about? That you might not reap the benefits of a glitch in the system? You crafted because you were told of the 30%, and knew it was a game error. Should the items be turned back to 25%? yes. Should you get any fuel you spent back? No. Will they get turned back? Probably not. Thanks for letting me know I am not Con, I was unsure about that. Yes they did spend the fuel. They knew the results of the crafts were a game error and that they could very well be nerfed. They decided it was worth the risk. If they wanted to be a safe all they had to do was ask any dev. I could honestly care less about these crafts, but dont use something you know is a glitch to try to gain an advantage then state you did nothing wrong. Yep, pretty much it. After the skilled update a ton op guns started popping up, now it is so diverse most players really dont know what op means anymore. I have a 41 ranged ar and a 47 ranged lr, there are crazy damage buffs and a ton more things added in the past. Many players complained about balance when the skilled update was released, and yet, no changes have been made significantly to those, so probably con will not look into the deadeye "issue" as they didnt to many other op items. Super Crafting Fiasco (Dramatically increased odds & new +30 crafting bonus cap) Not planed, not promoted - & Officially Labeled a glitch / bug. Con said they would fix this bug immediately and they didn't. I do not blame anyone who took advantage of this. A lot of resources have been spent & now Con has to get creative in finding a solution. There are now a bunch of 50% ranged crafts out there. Good luck Con - The Raiders & Alliance leaders I know & spoken with are increasingly dissatisfied with the events of the past few weeks. Trolling accounts have been around for years. Yet all of the sudden parody alliances are being disbanded; account names are receiving game suspensions & bans. The crafting error is certainly forgivable... but not when completely ignored & coupled with detrimental changes to alliance wars. Please give us some real feedback here, you locked the other Page with no real answer. Edited by Gabacho, 14 April 2017 - 07:11 AM. see the chat guys players spend many craft kits, fuels, keys/prems, component and etc in order to craft them. This 30% crafted item involved many players. around 2 weeks the 30% craft available. Now its capped into 25%. The Bug that enabled +30 Craft Bonuses & Insane Increase of crafting bonus odds was only around for a few days (Not 2 weeks). Some players knowingly & intentionally took advantage of this bug / glitch & are now furious at the prospect of Con fixing their mistake. From the people I spoke with the odds of +30 in the desired area were about 1 in 5 to 1 in 4. Even if con Nerfed these back down to +25 crafts everyone would have been extremely lucky to get such insane odds. So lets dismiss the illusion that this was in any way fair. There was a short window where this BUG existed. To suggest that it was a 2 week long Crafting Festival is ridiculous. So lets see what con does. I really expect that those 30% crafts get nerfed to 25%. I also expoect that players who abuse bugs for their own advantage get punished. 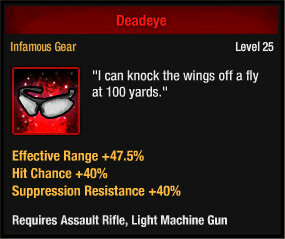 Those Deadeyes are insane and game changing. Con, do what has to be done! This crap needs to be fixed asap!